For comfort and convenience to go! 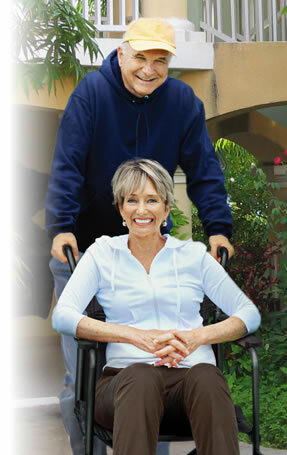 For added comfort, the Airgo® Ultra-Light Transport Chair comes with a padded seat, back and armrests. 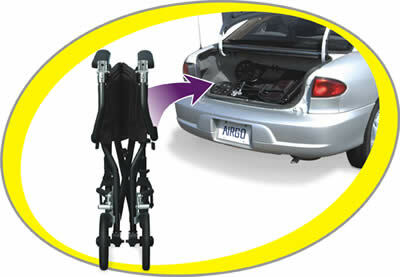 The footrests adjust in height to fit most people comfortably and flip up to make getting in and out safer. 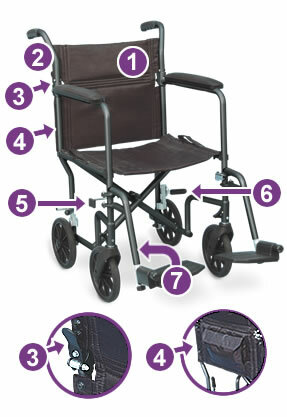 The built-in brakes add stability and safety when you get in/out of the chair and when it is parked. A convenient storage compartment located on the back of the chair holds your valuables. The ergonomically angled handle bars offer more shoulder room for both attendant and user. The outer access footrest release allows you to remove them easily for compact storage. And easy-touch levers allow you to fold the back of the chair for more compact storage.